The simple act of drinking your daily cup of coffee or tea can remind us of the many daily steps we can take to green up our lives. Choose organic tea over conventionally grown crops, for instance. Or bring your own reusable mug to your favorite café for that de riguer cup on the way to the office. There are even more ways to better your caffeine habit? You could, for instance, choose shade-grown, organic, Fair Trade, or Rainforest Alliance coffee, says Julie Craves, founder of CoffeeHabitat.com, a comprehensive website on all things conservation and coffee. Some of the same options exist for tea. This quick primer will help you get a head start on your road to sustainable imbibing. Shade-grown coffee: Coffee is grown on a large scale in clear-cut, sunny fields, but a clear-cut forest means far less habitat for birds that make rainforest canopies their home. Both the Smithsonian Migratory Bird Research Center and the Rainforest Alliance have put together a certification process that allows you to choose coffee grown in conditions that do better by the environment. You can take a look at the Smithsonian’s certification process here, and get a better look at the nuances of shade-grown coffee here. Socially responsible coffee and tea: Choose Fair Trade. This model, which also ensures a fair price for farmers it partners with, is an international agreement that currently covers 20 existing Fair Trade marks. For more information about Fair Trade labels, check with the Fairtrade Labeling Organization. Or go local. 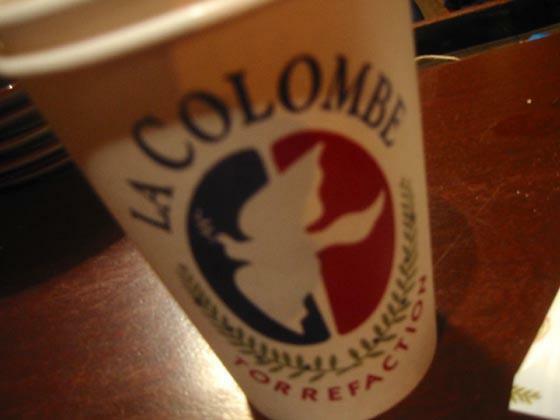 We love our La Colombe coffee here at The Hub. The Rainforest Alliance: Arguably one of the oldest organizations to step into monitoring the coffee and tea industries, RA also has one of its successes: they’ve paired with Unilever, makers of Lipton Tea, to certify all of its tea plantations worldwide by 2015. RA also certifies coffee—its label on a pound of your favorite brew covers both environmental and working considerations. You can learn more about RA’s certification process here. To buy sustainable coffee and tea, look for any of the labels mentioned above. You can also look for tea and coffee at your local grocery store from Equal Exchange, a nationwide distributor that works with only organic farms on a fair-trade basis. *Portions of this article were originally printed in A Fresh Squeeze. (c) Yi Shun Lai, 2007. Great article. Thanks for sending me the link. Hope it's useful for some good resources!